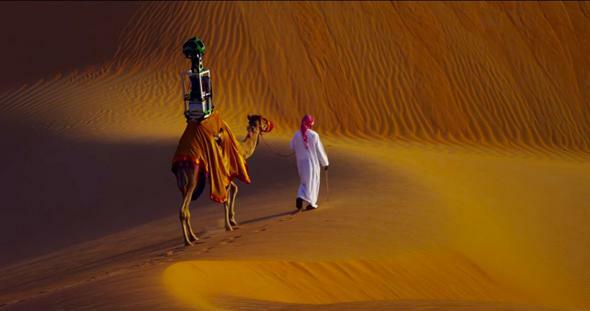 Google put a Street View camera on a camel in the Liwa Desert. When a company has $60 billion in the bank and is making $16 billion a quarter, there’s really nothing left for it to do but strap a camera on a camel and send it into the desert. That’s how you know you’ve made it. As part of Google’s effort to expand Street View beyond real streets to inaccessible spots like remote natural landscapes, it put one of its special Trekker cameras on the hump of a camel and sent it into the Liwa Desert in the United Arab Emirates. The video below shows the camel and its human companion walking over majestic sand dunes in the expansive landscape. Later the video gives a preview of how the footage the camel shot looks in Street View itself. The video is so amazing that I’m almost worried it isn’t real. But Google has done other incredible “Treks”—basically taking Street View off-road—that make a sojourn into the Liwa Desert seem totally plausible. Plus Google Arabia is a legit YouTube channel. If you’re never going to see the Liwa Desert in person, let alone have enough money to send a camera camel there yourself, you can scope things out on Google Maps instead. A great example of how consistently hilarious it is when animals and technology interact.